Yep, that was me alright, at the Gashole PR Convention. I paid to get in just like the rest of them and I wore my badge the whole time. 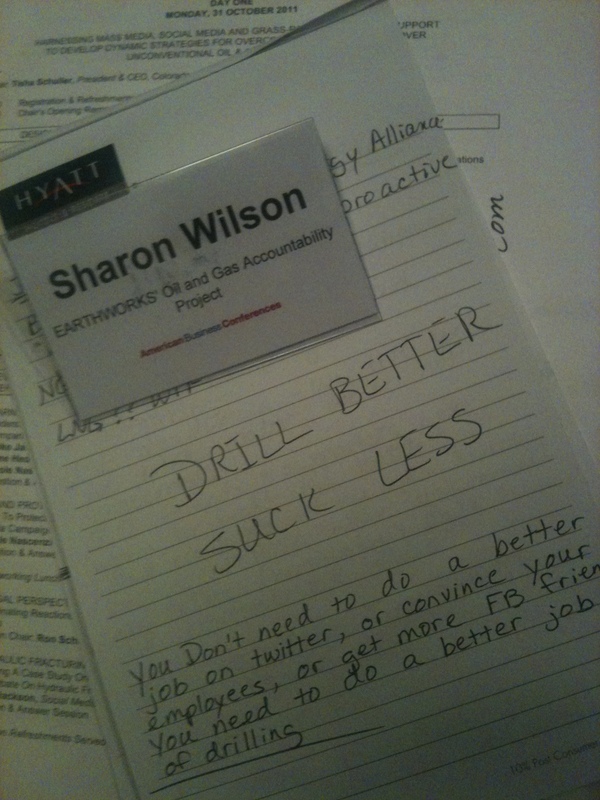 Here’s my badge and some advice I wrote for the Gasholes in my notes from the convention. I have so much to tell you Dear Readers. They are calling this a war. Seems like we might have a “Range” style counterinsurgency involved in our new drilling ordinances. The city will not give full disclosure on the members of the official task force, the meetings are all closed to the public, I have not been able to obtain the minutes to the “official” meeting, and no one will tell me if any consultant fees are being paid to anyone on the task force. My guess is that 3 “unofficial” members of the “official” task for are Ed Ireland, New Tech Global (PR company for big oil and gas), Eastern Research Group (the company who really screwed up the Fort Worth air study), and a couple of lawyers for industry. As an insurgent I will continue to hold my head up high (maybe the air is cleaner up there) and give em hell. You are funny. I have been trying to hold my head up high now for awhile. I found I need to do more studying, so I am going to go to the hills where the air is fresher. Then I can put my head down into a book and take some classes like Biology and Water Quality. You know – educate myself! I know the industry pretends a lot. But ‘Drill better!’? No thanks. I want this drilling stopped yesterday. Not in our state! Or anywhere. Obviously they can’t drill better or anything approaching better or they wouldn’t have to employ such extreme measures. NICE. Sharon, you’re one of my heroes, seriously. Thank you so much. “Drill better”? We need ti all to be STOPPED entirely. Wonder what makes anyone think it is possible to drill clean, crazy…. Sharon – You Rock ! In our current system of Corporatocracy / Oligarchy, propoganda is very big business. Government and Industry manage our perceptions with the most sophisticated techniques money can buy. It’s not surprising that Pitzarella’s bible is Rumsfeld’s Rules. Most people just don’t have a clue about what’s being done to them. I have long-distance love for two Texas women; you and Elizabeth both Rock ! Strange – somehow WE’RE the insurgency when THEY are the ones planting IED’s in our neighborhoods? I think they got it backwards. Wait, they’re talking about how Range has psy ops people that have experience from Iraq and Afghanistan? Those two operations worked so well, I see how they want quality people onboard.